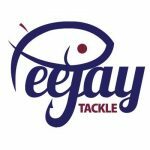 For this year’s league, there would be three sections, two at Perry St and one at Sadborow, for the first match there would be an open draw and you would be in the same section of seven anglers for three matches and then there would be another open draw, which I think is a really fair way of doing it. We met at Millfield cafe for breakfast and it was every bit as good as I remembered from last year. I then handed over all my dosh to the Hoff for pools (£20), superpool (£5), league entry (£20) and some maggots (£3) so with my belly full and my wallet empty, we headed out to Perry St to do the draw. It was great to see Rocking Roy fishing the league and also Commander Smithy who I hadn’t seen for ages. Hoff announced the draw and I delved in and when I opened the little container, I saw peg 7 staring back at me, a decent area. For the sections, the pond was basically split in half so I was in with the top end of the pond which included corner pegs 10 and 11. 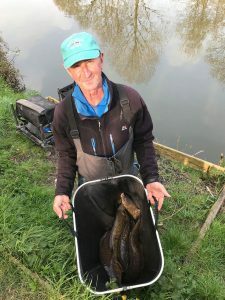 Paul Homewood was on 10 so that’s two corners in two matches after he won from peg 20 in the last one, Hoff was opposite on 11 and the other anglers in my section were Oz on 8, Rich C on 12, Pup on 13 and Exeter Mike on 14. As I walked up the pond, I realised 6 wasn’t in which would hopefully be a bit of a bonus. 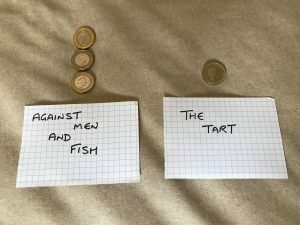 The Tart had drawn peg 4 at Sadborow so I wouldn’t have the ‘pleasure’ of his company for at least three matches and with us being on different ponds, the side bet would be on where we finished in our sections. It was overcast and I couldn’t see many carp swimming about but as always I set up my little dibber for fishing shallow and would give it a go for a bit. I’d actually spent some time on Saturday tying hooks and making a few rigs up including a nice little Smithy special. 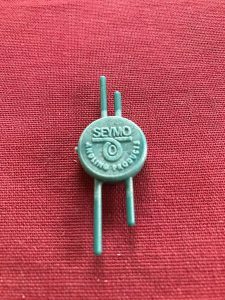 I also found a Seymo loop tyer I’ve had for years but never used and OMG, how easy is it to use and how much simpler does it make tying hair rigs and loops, why haven’t I used this before!! 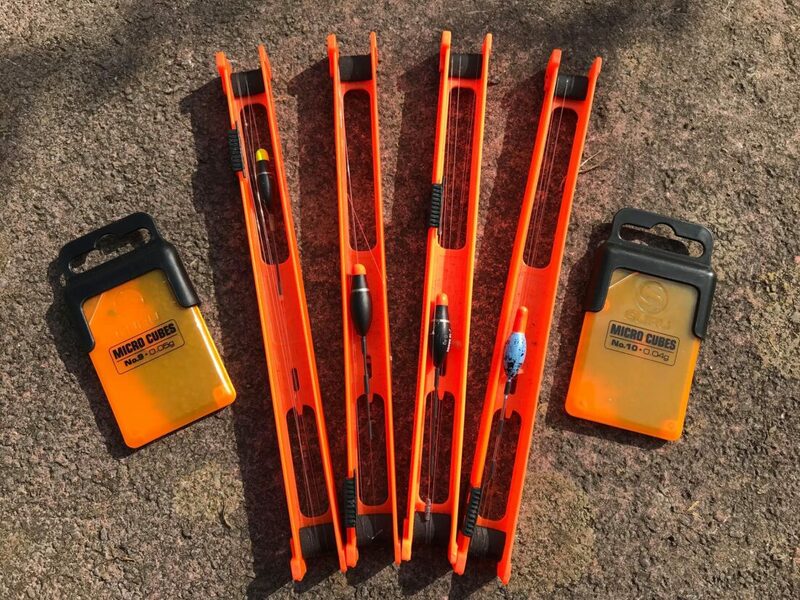 What a brilliant little tool! The other rigs I set up were a Drennan 0.4 gram Carp 1 for the top two plus line plus a 0.3 gram Drennan Margin Crystal for the inside to my right by the cormorant roost. On the side tray I had live and dead red maggots, Bait-Tech Scopex corn, micros, 6mm pellets and I’d also mixed up some groundbait the night before. I was ready in plenty of time so went up to see Paul in peg 10, it looked nice but I did say to him that it might be a little early for it yet as Mark G only had one carp when he was on it in the last match. Hoff got us underway and I cupped in some micros, corn and dead reds on the short line before starting shallow at 11.5 metres, I was pinging in a few 6mm’s and after only five minutes, the float disappeared but when I lifted the pole up, instead of elastic streaming out, a fish bow waved off, so maybe a liner. Oz had an early carp and then shortly after I had a three pounder to get off the mark. I missed two more bites (or liners) and thought I might get a few but then Mike from somewhere near Exeter had one followed by Dunner and the Hoff and it looked like they’d all caught on the deck. There were odd bubbles coming up so I went out with my depth rig with corn on the hook but never had a touch. Paul had a carp and Mike struck into a fish which came flying out of the water before he netted a nice skimmer. Going into the second hour, it looked like the pond was fishing hard for everyone, the Hoff lost a carp but then landed his second not long after, followed by a nice tench to go into the lead in our section. In the other section, Bish had caught several carp on peg 5 and I’d seen Carl over on 17 land a beast but if the bankside grapevine was anything to go by, it sounded like it was hard going for most. Exeter Mike had a lump and then I had my second carp. 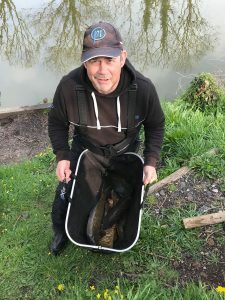 After two hours, Hoffy had two carp and a tench, Mike had two and a bream, I had two and then Oz, Paul and Pup had one apiece so it was all very tight and things could change very quickly. I hooked a fish but it was only on briefly and I think it was probably foulhooked, next chuck, the float shot under and straight away I knew it wasn’t properly hooked as it went berserk! It was on for ages and was starting to think I had a chance of reversing it in the net, when it came off and there was a scale on the hook. I did manage a two pounder but still thought I was behind Hoff and Mike as they’d both had decent fish whereas my three would probably only go 8lb between them! Then sun was threatening to come out and I could see more and more dark shapes just underneath the surface but despite trying to tempt them, they just weren’t interested. As the halfway point approached, I had a go on my top two plus two line but no indications, so I went back out shallow and the rest had done it some good as I hooked a good fish and after a lengthy scrap I netted a nice 6lb fish and was back in the hunt. I stalked a decent fish to put me on five carp and there were odd fish being caught now, Hoffy and Mike added a couple more, Dunner had another from his inside line and Oz had his second fish. With around two hours to go, I fed my margins for the first time, cupping in four pots of loose groundbait, dead reds and micros. Back out on the long line and I flicked the rig in front of a pod of carp and the float buried and elastic streamed from the pole tip. It was obviously a big fish so I took my time with it and when it came to the surface, it was a lump and looked 8lb plus. Oz hooked one on the inside line that did it’s best to take him round the tree stumps and he did well to get it out, I landed carp number seven, another 5-6lb fish, went back out and was into another nearly straight away, it was another lump and it wasn’t doing a lot when it came off at the net! I was gutted and with Hoff now on six carp and a tench and Mike had five and a bream, I felt sure that fish was going to cost me. Worse still, I couldn’t get a bite shallow now. It was time to have a look up the edge, I had a couple of little knocks but no positive indications and for the remainder of the match I switched between the inside and shallow long but didn’t have another fish although crucially nor did Hoffy or Mike and I still thought it might be close. 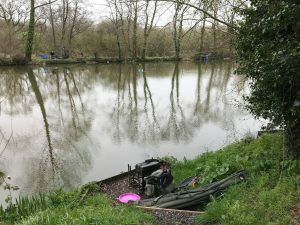 The scales started with peg 1 and Mark G had one carp for 4lb 6oz, Picky had 19lb 2oz from peg 2 and then Howard had 21lb 2oz from peg 4, Bish was next and his eleven carp went 52lb 5oz which would win that section comfortably. Then it was my turn and my seven weighed 35lb 1oz (four carp for 27lb and three squeakers for 8lb), Oz had three carp for 7lb 14oz and then Paul had 12lb 2oz from peg 10. We walked round to the Hoff and his first weigh was 9lb 6oz and when he said he had four lumps in his other net, it was going to be tight, Les called it at 22lb 6oz which gave him a total of 31lb 12oz. 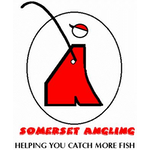 Rich didn’t weigh in peg 12, Dunner had 13lb 10oz and Mike (from near Exeter) had 25lb which would put him third in the section. 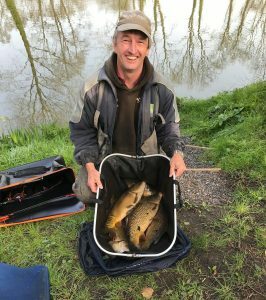 Next was Carl who had some lumps for 21lb 4oz to finish second in the other section, just beating Howard by 2oz, who, by his own admission, made a ‘schoolboy error’ by throwing back a few ounces of silvers! Les had 12lb 6oz from peg 19 and Shane weighed 10lb 14oz from peg 20. 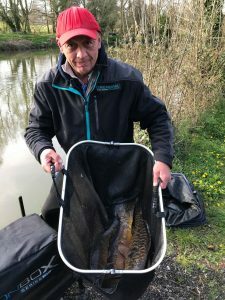 When the Sadborow crew arrived back, it had fished relatively hard out there as well, Bushy had the top weight with 54lb from peg 2 and he had plenty of room with empty pegs either side, the Tart came second with 53lb 2oz from peg 4 (and had to pay me a nugget) and Smithy weighed 43lb 12oz for third from his favourite peg 8. He’d also brought a fine selection of treats for us, Tesco’s finest chocolate cookies, oat and raisin cookies and granola squares! 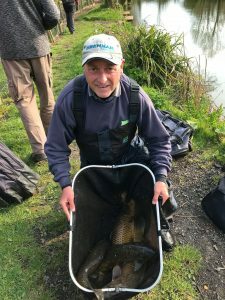 Butch was fourth out there with 31lb 10oz from peg 9 followed by Rocking with 17lb 10oz from peg 7, Feeder Mike with 12lb 12oz from peg 6 and Chilly had 7lb 12oz from peg 5. Looking at the results, a bit of space was obviously a massive bonus as over the two ponds, seven of the nine people who picked up money had an empty peg next to them. So a great start to the league with maximum points and I had a really nice pick up of £90 (£60 pools and £30 from the superpool) plus the all important shiny sliver of Torquay gold and the score this year is 3-1 in my favour at the moment. 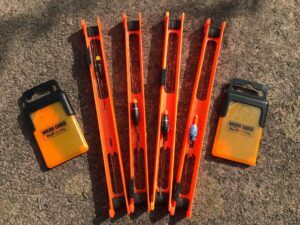 In a new feature for the blog I’d like to introduce you to the Nuggetometer! 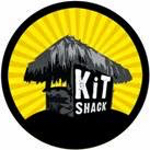 Another quick reminder to sign up for the newsletter if you haven’t already, details are in the sidebar on the right if you’re reading this on a laptop or scroll down if you’re on your phone. As soon as I reach 50, I’ll do a little exclusive competition.